How many times have you been just sitting down to eat dinner and the phone rings? Or maybe you’re in the middle of watching your favorite tv show when the call comes in. The last thing you want is to be disturbed by some automated robocall offering you “deals” on something you have no interest in. It doesn’t seem to matter that there’s a “Do Not Call” list. These annoying calls are generated by someone who must not get the calls at their home. If they did, they might not be so quick to bombard the rest of us with dire warnings about the hidden viruses lurking in our computers or giving us a “final notice” from Cardholder Services about our credit card. 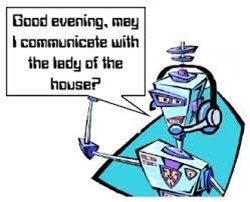 The FTC has long been aware of the abuse of phone solicitation by these automated intruders. They report that there were over 200,000 complaints filed last year alone. The companies that are doing the calling clearly have no fear of any punishment for their actions. Well, things might be about to change and the robocallers might find their dialing days are coming to an end. Sen. Claire McCaskill (D-Mo.) has introduced legislation to strengthen the Federal Communication Commission's ability to crack down on the companies generating the calls. The bill she has introduced would give the FCC more enforcement authority, allowing harsher penalties on robocallers. It would also allow the agency to crack down on “spoofers,” robocallers that hide their identity from caller ID systems or appear to be a call from a legitimate business entity that you might want to talk to. If passed, the bill would also expand the scope of current spoofing rules to apply to anyone outside the country who targets a U.S. resident. The penalty for robocall violations would increase from $16,000 to $25,000 per call. Time Warner found out just how expensive robocalling can be. Recently, a federal judge awarded an Irving, Texas woman almost $230,000 for suffering through 153 robocalls. Even though she complained, Time Warner continued to call her with “exciting offers”. The judge must have had his share of annoying calls because he tripled the penalty to $1500.00 for each call. As you might imagine, Time Warner is scrambling to figure out how to deal with this decision. The woman who filed suit is delighted with the $230,000 award but stopping the calls will be priceless. Brendan Spaar hopes this sends a message to all telemarketers. If you robocall, be prepared to pay for the call.